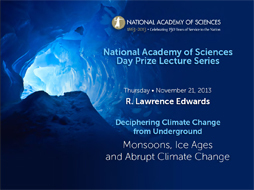 R. Lawrence Edwards, the 2011 recipient of the Arthur L. Day Prize and Lectureship, presented a series of lectures on "Deciphering Climate Change from Underground" at Oberlin College & Conservatory in November 2013. Dr. Edwards is the Robert D. and Carol C. Gunn Professor and Distinguished McKnight University Professor in the Department of Earth Sciences at the University of Minnesota. He is an isotope geochemist well-known for his role in the development of modern uranium-thorium (or Th-230) dating methods and his application of these methods to the study of climate history and ocean chemistry. His approaches have improved the accuracy of radiocarbon dating, with the long-sought goal of a complete calibration of the radiocarbon timescale now in sight. 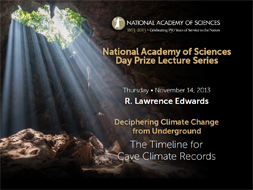 Dr. Edwards champions cave deposits as recorders of historic and pre-historic climate. Among other projects, he and his large international group of collaborators are currently working on piecing together hundreds of thousands of years of Asian Monsoon history from caves in China. 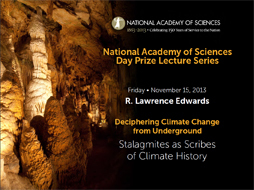 Using innovative strategies, he relates his cave climate histories to those from ocean sediments and from ice cores, thereby establishing patterns of changing climate in time and space. His work helps us to understand the causes of abrupt climate change and the causes of the rapid melting of ice sheets at the end of glacial cycles. Some of his research assesses the relationship between climate change and cultural history, drawing plausible links between global shifts in rainfall patterns and major cultural changes. His cave records that cover the last several centuries contain some of the strongest evidence yet for human-induced climate change.